Mid-Continent’s standby attitude module provides attitude, altitude, airspeed and slip information in a self-contained small unit that can be mounted horizontally or vertically. The new MD 302 standby attitude module (SAM) developed by Mid-Continent Instruments and Avionics offers avionics installers another option for standby instruments, especially in panels with little extra space. The MD302 is entirely self-contained and provides attitude, altitude, airspeed and slip information in a small package measuring just two inches by five inches and weighing 1.6 pounds. 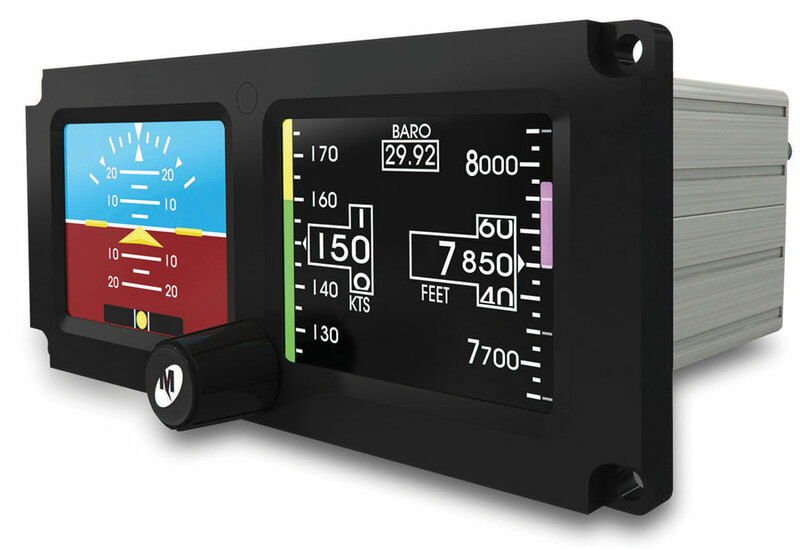 The MD302 can be mounted horizontally or vertically, and it contains two led-backlit LCDs, one displaying attitude and the other airspeed and altitude. Elliott Aviation (Booth No. 1706) has announced that it plans to offer the MD302 to buyers of its Garmin G1000 upgrade for King Air turboprops. The company’s first MD302 installation is in the Elliott King Air G1000 demonstrator. The MD302 can interface with primary avionics and synchronizes data from Arinc 429 outputs. The unit is powered by a lithium-ion nanophosphate battery that runs for at least 60 minutes, although in tests it has run for up to 2.5 hours, according to president and CEO Todd Winter. Hooking up the MD302 requires only power (10 to 32 volts), pitot and static connections. “We designed this unit for a lot of flexibility and ease of installation,” he said. The MD302 can accept baro settings from other instruments, so the pilot doesn’t have to set the altimeter on multiple devices. Mid-Continent, which manufactures instruments, backup instruments and emergency power supplies, has been working on the MD302 for the past three years. “This is a logical extension of filling that need for our customers,” said Winter. The problem with existing standby instruments is that they require more space than is available, especially considering the large size of the LCDs installed in modern cockpits. While there may not be room for a three-inch backup attitude indicator, there usually is space for an MD302, mounted either horizontally or vertically. Dramatic reductions in the cost of aviation-grade electronic components made it possible to manufacture the MD302 for a relatively low retail price of $10,600. Mid-Continent is also working with some OEMs on adding a remote MD302 without the display or an MD302 without the backup battery, but these configurations won’t be available in the aftermarket. Because the standard MD302 has its own backup battery, installers might be able to remove emergency battery packs, which means a net gain in useful load. The lithium battery pack should last six to eight years, and it is field-replaceable. Installers can set optional parameters for customers when adding the MD302 to an instrument panel. The attitude indicator mini-airplane can be changed, as can airspeed indicator markings, which include a Mach overspeed barberpole for jets.